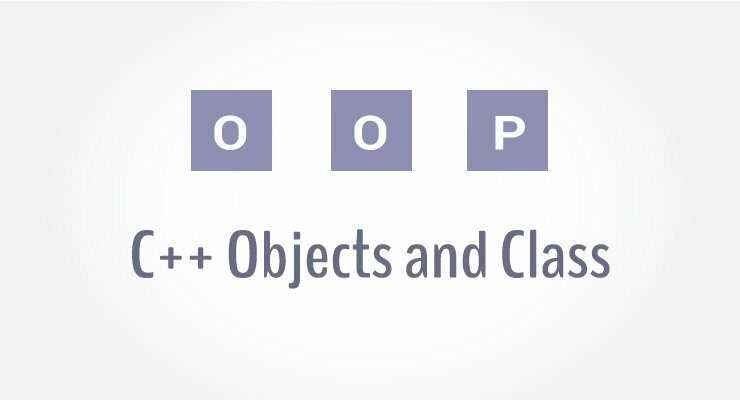 In this article, you will learn to work with objects and classes in C++ programming. C++ is a multi-paradigm programming language. Meaning, it supports different programming styles. One of the popular ways to solve a programming problem is by creating objects, known as object-oriented style of programming. C++ supports object-oriented (OO) style of programming which allows you to divide complex problems into smaller sets by creating objects. Object is simply a collection of data and functions that act on those data. Before you create an object in C++, you need to define a class. As, many houses can be made from the same description, we can create many objects from a class. How to define a class in C++? A class is defined in C++ using keyword class followed by the name of class. The body of class is defined inside the curly brackets and terminated by a semicolon at the end. Here, we defined a class named Test. This class has two data members: data1 and data2 and two member functions: function1() and function2(). You may have noticed two keywords: private and public in the above example. The private keyword makes data and functions private. Private data and functions can be accessed only from inside the same class. The public keyword makes data and functions public. Public data and functions can be accessed out of the class. Here, data1 and data2 are private members where as function1() and function2() are public members. If you try to access private data from outside of the class, compiler throws error. This feature in OOP is known as data hiding. To use the data and access functions defined in the class, you need to create objects. Here, two objects o1 and o2 of Test class are created. In the above class Test, data1 and data2 are data members and function1() and function2() are member functions. How to access data member and member function in C++? This will call the function1() function inside the Test class for objects o2. It is important to note that, the private members can be accessed only from inside the class. So, you can use o2.function1(); from any function or class in the above example. However, the code o1.data2 = 5.5; should always be inside the class Test. In this program, two data members data1 and data2 and two member functions insertIntegerData() and insertFloatData() are defined under Test class. Two objects o1 and o2 of the same class are declared. This sets the value of data1 for object o1 to 12. In this program, data2 of o1 and data1 of o2 are not used and contains garbage value. How to pass and return object from a function?